The R1 Hi-Fi Rack is a modular rack solution designed to provide optimal conditions for the operation of state-of-the-art digital and analogue audio equipment. 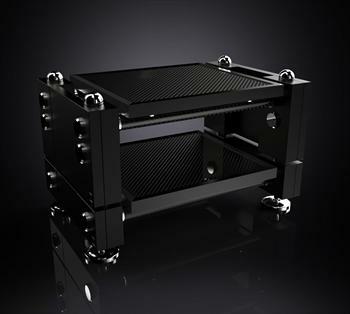 The R1 vertical nodes are cross-linked by elegant carbon fibre ‘Isobars’ which form the support for the carbon shelves. 14mm steel bars, tied at the ends with precision machined sockets run through the centre of the Isobars, compressing them under tons of pressure along their length. This improves the energy transmission pathway along the carbon fibre tube, creating a pathway between the sensitive audio components and the nodes that draw unwanted energy, which would otherwise manifest as resonance in the audio components, away and into the nodes that absorbs and dissipates the energy. At the interface between the carbon fibre Isobar and the carbon shelf, Wilson Benesch have designed fluted cups that are precision machined to create two points which meet with the carbon fibre. The R1 is Total Engineering.